NEWS ANALYSIS: Public debate over Norway’s offshore oil and gas industry is gushing, just as production, profits and the government’s granting of new exploration licenses are also reaching new heights. Top government officials and even leaders of the biggest opposition parties in Parliament, however, aren’t fully responding to ever-rising concern over climate change, and even ignoring calls to finally rein in the oil industry. Norway’s prosperity is clearly more important than the planet, claim frustrated critics and increasing numbers of voters. The debate is over what should or can be considered “defensible” at a time when climate change is becoming more and more visibile, also in Norway. Despite all the government’s talk for years over the need for omstilling (restructuring) of Norway’s economy, so that it won’t be so dependent on oil and gas revenues, little real change has occurred. Now, with oil prices back up over USD 60 per barrel, the industry has cranked up again, with Norway’s own state oil company Equinor reporting more strong profits last week and predictions that production will be higher than ever in 2025. *** Freiberg’s ministry just handed out a record number of oil and gas exploration licenses, even though the government claims it’s committed to reducing carbon emissions. WWF calls all the new oil licenses a “violation” of the newly expanded conservative government’s own government platform, not least because licenses have also been given in areas known as rich fishing grounds. Only the small parties in government and Parliament object to the issuance of more exploration licenses, while the Labour and Center parties also doled out large numbers of licenses when they held government power from 2005 to 2013. *** The oil industry pretty much got what it wanted when the Conservatives-led coalition presented its new government platform last month. 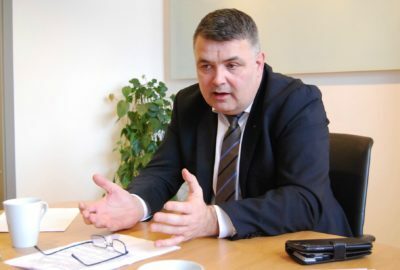 Industry players and their lobbyists (led by former top Labour Party politician Karl Eirik Schjøtt-Pedersen), had warned the coalition against making any changes, for example, in Norwegian oil policy and the regulations and incentives that currently apply to it. Schjøtt-Pedersen had proudly pointed to projected new investment in the investment and all the jobs that can create. 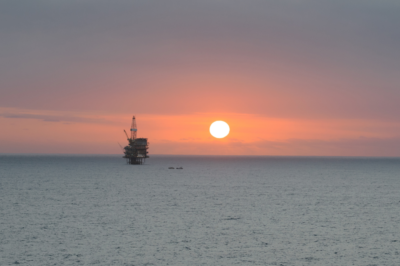 Equinor, which changed its name from Statoil last year, had alone claimed it would spend NOK 89 billion (more than USD 10 billion) at Norwegian oil supply companies if it’s allowed to drill 3,000 new wells in the coming years and if the rules stayed the same. The small Liberal Party tried but failed to get its fellow government members to dump Norway’s generous and controversial incentive (called the leterefusjonsordning) that lets oil companies write off exploration costs, even though it means taxpayers ultimately take the risk of covering the costs of unsuccessful exploration. *** Another attempt to even debate the oil exploration incentive fell flat. 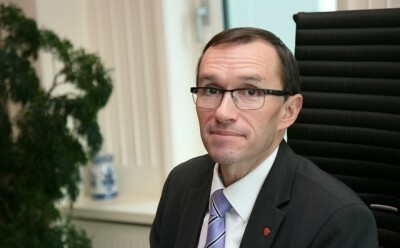 The Labour Party’s spokeman on climate issues, Espen Barth Eide, was all but reprimanded by Labour leader Jonas Gahr Støre after Eide ventured to suggest in newspaper Klassekampen that “we must have a discussion on whether that policy is the correct way forward.” Eide won immediate praise from several newspaper editorial writers, environmental groups and professors, but his former Labour colleague Schjøtt-Pedersen immediately objected and Støre listened to the oil lobbyist (and, unusually, agreed with the government), not his own party spokesman. Støre stressed that Labour’s support for the rule, which has refunded NOK 100 billion in exploration costs to oil companies since 2005, “stands firm.” Proponents argue the return on the state’s investment in exploration has been much greater, even though it puts taxpayers at risk for unsuccessful exploration operations. Eide gamely accepted how Støre hushed him up but didn’t entirely back down, perhaps sensing that there’s a growing debate over oil with Labour despite all the jobs it creates. Labour’s youth organization firmly opposes ongoing expansion of the industry and chapters in Northern Norway and, most recently, Bergen, have come out against any drilling off Lofoten, Vesterålen and Senje. It’s expected Labour as a whole will do the same, while still trying to protect oil industry jobs. ***The oil industry itself, meanwhile, has claimed it’s trying to become “more green,” and Equinor has announced major investments in wind power, for example. 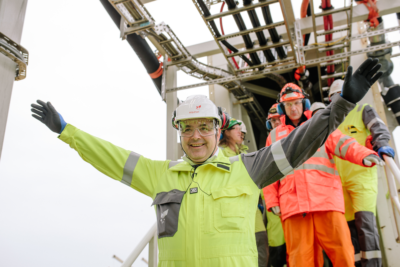 When it met analysts in London last week, and announced how it was earning more money now than when oil prices were over USD 100 a barrel, Equinor CEO Eldar Sætre said he’d never been more optimistic about prospects for the oil industry during his 40 years in the business. After delivering fourth-quarter operating results of USD 4.4 billion (up from USD 3.96 billion the year before) Statoil also announced it would be boosting its exploration budget and investing billions more in oil, but wouldn’t say how much would be invested in renewable energy or whether it would meet an earlier stated goal of earmarking 15- to 20 percent of its total investment budget in renewables like wind power and solar energy by 2030. Suddenly that was merely “something we’re working on,” and “an ambition,” Sætre told reporters. Meanwhile, major Norwegian oil and gas producer Aker BP is also among all the firms bullish again on oil’s future, especially after announcing another major oil and gas discovery last week at its Froskelår (Frogleg) project on the Alvheim oil field. It’s intensifying its hunt for more oil, while Norway’s oil service branch is also boasting of an upturn in its sector, and better times for the Norwegian oil business. Instead of setting off jubilation within Norway, that the oil crisis is over and the economy is more than recovering, all the recent news of more oil exploration and more production is setting off concerns and in local media nearly every day. The concern is coming not just from the environmental organizations (while WWF decries opening up more areas of the northern seas to exploration, Bellona claims Equinor and the government are going in the wrong direction) but from academia and the public in general. Two professors recently headlined a commentary in newspaper Dagsavisen as “Equinor’s climate masquerade,” blasting the company’s public relations campaign in Norwegian media this winter as little more than “greenwashing” its core business. “For one thing, it’s an attempt to take attention away from the company’s enormous contribution to carbon emissions through its oil operations,” wrote Hanne Svarstad, a professor at Oslo Metropolitan University (OsloMet), and Tor A Benjaminsen, a professor at NMBU in Ås. The also claim Equinor’s stated intention to invest in rain forest preservation, simply follows Norwegian governments’ strategies over the last decade, to buy their way out of cutting emissions themselves, by paying other countries to cut emissions instead. Other Norwegian professors have also blasted both the oil industry’s and government’s oil policies for years, and that’s spreading to the economists’ sector. A new organization, “Rethinking Economists,” is calling for more critical thinking and its leader, economist Ebba Boye, is hosting an conference this week that focuses on economy and nature. Some economists, including former oil analyst Thina Saltvedt, have already been questioning the long-term profitability of fossil fuels, with Saltvedt opting to move over to analyzing green energy for Nordeal Markets. Boye also questions the very prosperity that Oil Minister Freiberg, the government and other top politicians seek to maintain with oil. Boye told Dagsavisen over the weekend that economic growth brings increased consumption, and that’s not good for the environment. She also worries about “all the greenwashing out there,” and is “in despair” over the 83 oil licenses Freiberg handed out. Meanwhile even some former politicians from the Conservative Party have claimed the current government is “drunk” on oil and should boost efforts to find alternatives. 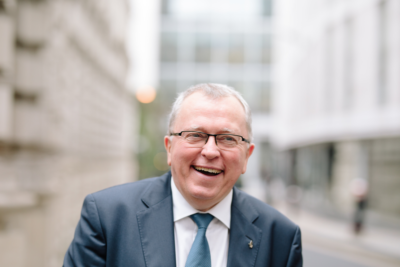 Kai Eide, a veteran diplomat and former politician for the Conservatives who has sinced joined Labour, wrote a commentary in newspaper Aftenposten last last month headlined “The Oil Age can end before we know it. We must be prepared.” Eide claims the ongoing reliance on new oil and gas fields sends the wrong signal, noting that state statistics bureau SSB (Statistics Norway) has warned that exports from the mainland (not offshore) must more than double by 2040 in order to maintain the welfare state. Diversification away from oil through development of new products and services, Eide wrote, is urgently needed. Existing innovation programs aren’t enough, he worries. “We need brave politicians,” headlined another commentary in which comedian-turned-activist Sigrid Bonde Tusvik noted how she’s “worried about a lot of things, the most important, of course, that the world is boiling over and we need to secure sustainable development.” Ordinary citizens are writing letters to the editor pointing the paradox of Norway pumping oil while maintaining an image of being environmentally conscious. Surveys show that climate change continues to top voters’ concerns worldwide. The latest, released on Monday by the US’ Pew Research Center, showed that climate change topped all other security threats in 13 out of 26 countries, and ranked high in all counties. As debate flies in Norway as well, Oil Minister Freiberg and his colleagues still claim their policies are working, even though Norway’s own carbon emissions keep rising. Freiberg reverts to the old arguments that emissions from Norway’s industry are lower than other countries’ oil operations, that Norwegian gas plays an important role in replacing coal as a power source in Europe, that Norwegian oil and gas operations will continue to electrify and that “we shall cut emissions” (by a stated 40 percent by 2030). Just not now. “If we were to shut down Norwegian oil fields (or presumably stop exploring for new oil), it would have consequences,” Freiberg says. “The oil and gas that the world still needs would have to come from somewhere else.” He also defended the exploration incentives in Norway, stating that “it’s important we have predictable, consistent policy.” He says the message he gets from Brussels is that the EU’s demand for oil and gas will continue and that Norway is important. 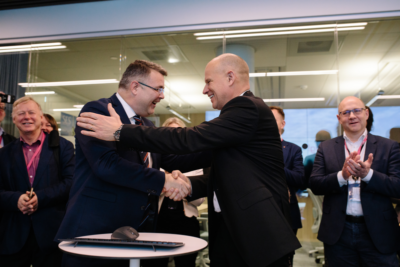 “For me, there’s no conflict between meeting climate goals and activity on the Norwegian Continental Shelf,” said Freiberg, who briefly worked as a state secretary in the oil ministry before landing its top political job after a career in the Progress Party. Before being elected to Parliament in 2017, he was mayor of Hadsel, a small community in the northern county of Nordland from 2007 to 2015, and told state broadcaster NRK how he had earlier worked on fishing boats and in a fish feed firm after “getting tired” of school after Norway’s obligatory grunnskolen that ends at age 16. He didn’t want to speak English with the foreign corespondents he met in Oslo on Friday, and the one-hour question-and-answer session was thus conducted in Norwegian. Freiberg, age 47, doesn’t seem to be listening to experts and climate researchers who believe carbon emission goals can only be met if up to two-thirds of the world’s remaining oil remains in the ground and under the sea. “The energy mix will continue to demand oil and gas,” he said, repeating again that climate change is a “global program” that’s not up to Norway to solve, while also claiming repeatedly that Norwegian policies work. Asked if he was worried about last week’s report about how rapidly Svalbard is being affected by climate change, he paused and said “yeah,” but decined to elaborate. He doesn’t want any changes in current policy, oil production or even exploration in the Arctic. The Progress Party, which has had its share of climate change skeptics, has held political control of the Oil & Energy Ministry since 2013 and Freiberg is every bit as bullish on oil as his predecessors. Several now work in the oil industry and not just those from his party. The Center Party’s Ola Borten Moe is also active now in oil exploration and production. Newspaper Aftenposten reported this week that Freiberg and his Progress Party predecessors have removed the word “climate” from the annual instructions they send to the powerful Oil Directorate that are meant to reflect political priorities for the year ahead. The former left-center government still wrote that the directorate “shall contribute to Norway meeting its climate- and environmental goal” until it lost the election in 2013. By 2016 the word “climate” had been removed and hasn’t been included since, while variations of the word “environment” have changed. No declines in Norwegian oil exploration and production can thus be expected any time soon, no matter what happens on Svalbard, whether Norway’s carbon emissions climb again this year or even whether Freiberg and his government colleagues are voted out of office at the next election in 2021, unless Labour toughens up. It remains questionable, though, how long the politicians can expect mainland businesses and ordinary folks to accept emissions cuts themselves and their costs, while the biggest generator keeps drilling and pumping and debate heats up.